Rambling Moose: Oh Scrapple, Why Do You Taunt Me? They say that South Florida is the Sixth Borough of New York City. I think that's a bit inaccurate. A better title would be "Little New Jersey". It's chock full of refugees from NYC, of course. I can even find a good Brooklyn Bagel here, and I know of a decent Jewish Deli if I choose to drive a bit. Lox, Bagels, and Cream Cheese... Yum! But I can also find Philadelphians by the Septa Train Load, People from the "Pennsylvania Dutch" areas out by Lancaster and Reading, and folks from Connecticut by the Fishing Boat full. We're all here. I personally think Broward County is "Little Long Beach Island" because it's mixed pretty thoroughly of New Yorkers and Philadelphians. That Philly Pretzel place nearby even has a Drexel University flag inside it. So I wasn't completely shocked when I went to the Big Publix in downtown Fort Lauderdale and found some Habersett's Scrapple. The one near me in Wilton Manors has packets of Taylor Ham, which was a treat too. If you know either of those products, you are from an area that is roughly 150 miles from around the Liberty Bell in Center City Philadelphia, know someone from there, or just got curious when you saw them in a random shop. Both of those are what are loosely called "Breakfast Meats". Fry them up like you would bacon. Serve with your eggs in the morning. In this case, I served my Scrapple with a 2 egg onion omelette on top of a home made rye bagel with some extra sharp cheddar. Not a light breakfast, but I finished it off with my coffee and that was it until lunch that day. Scrapple is vaguely like sausage. It's sold in a brick, frozen. Like sausage you don't really want to know what's in the stuff. Other than corn meal, spices, and perhaps some thickeners, it is a Pork Product. Everything but the oink, as we say in Philly. There are two schools of thought, either thick and creamy or thin and crispy. You slice the stuff off the brick, toss it in a skillet, and fry it up. But in my case, I'm being taunted. I prefer mine creamy in the middle, crisp on the outside. First things first, that slicing bit. I remember my father on a weekend morning. Only on the weekends. Saturday or Sunday, and you will like it. Get the picture? He'd fry up the slab of Scrapple in the skillet, getting it good and crispy on the outside, hot and creamy inside. Served just as I like it. Yeah, Dad taught me how to eat the stuff, I'm sure your parents broke you like that too. Except there's the rub. That slicing of a slab. Doesn't go so well. I have a habit of making things in "prepared serving sizes" like they're listed on the package. Two ounces of the stuff is one serving, 120 calories. Not terrible. Except that that is an eighth of a brick. How do you slice an eighth of a brick of frozen sausagey-like goodness into a skillet? You don't. You thaw it when you get it home from the Big Publix that you park on top of, or the Acme in Roxborough in Philly, or even the Shop Rite in Cherry Hill. Put it in the refrigerator on Friday Morning. Saturday Morning it will have thawed enough to be sliced. Now you have a roughly 37 degree Fahrenheit, 2 degree Celsius block of grey gritty gooey block of Pork and Pork By Products with Spices. Cut open that Red and White package. Some undefinable liquid leaks out. The package is briefly looked at and then you realize that the Quixotic desire to be thrifty is pointless and you reach under the counter for a plastic container to place the remnants in. Lay the Scrapple block lovingly on a "Cutting Plate". You want an eighth of the block for your serving, right? Go to the knife drawer and select the sharpest blade you have. You will need it. Walk over to the cupboard and grab a ceramic coffee mug and sharpen it on the bottom, or just use your sharpening stone. No, really, you need deadly sharp here. The dog will now be curious, this would not be a good time to step on his feet. Be careful there. Look at that block of Scrapple lenghtwise. Lovingly draw your blade on the top to mark but not cut it in half. Cut each half in half, then each in half again. You have just approximated eight pieces. Yeah you could just toss the damn thing in the skillet and make a monster scrapple but where's the fun in that? Now look at your eight even pieces. The outermost one needs to be cut off the block. As you draw back that deadly sharp knife through the slightly gelatinous gritty block of savory goodness, you realize this won't go well. It begins to break apart like a meteor hitting the atmosphere. Instead of getting a thick slab of grey goodness to toss in the skillet, you have three "large" pieces, and a pile of grit. Cursing at your luck, you walk across the kitchen to the preheated skillet. I can't heat it up too high because the skillet has a non stick surface and if you have a parrot, that will kill them if it scorches. You had better have greased the thing up because if you hadn't you're going to make scrapple crumbles. Even now, you have a pile of grit to toss to the flames. I had saved a couple ceramic tiles. They're nothing special being from my old kitchen in Philadelphia. Some day I will incorporate them into this house here. For now, they're wrapped in aluminium foil and used to press things down to flatten them in my skillet. They're my very own "Fryer Blocks". I take my Scrapple crumbles, and edge them together. Pressing down with the Fryer Block, I am able to roughly reshape the crumbles into a solid mass. Now, patience is a virtue. Cook them until the bottom crisps up. I can't tell you how long that is. I went out into the next room, found some wire and needle-nosed pliers for a project, made two copper loops, finished cleaning the counter, and started roasting a batch of coffee in the time it took to get that brown scrapple look that I wanted. Five Minutes a side? Six? Ten? I just don't know! With a plastic spatula, I tease the scrapple up from the bottom of the skillet. It wants to stick, but this stuff has a sheen of grease, a gift of the Pork goodness inside. Flip it over and hope that it won't fall apart. It did, push it back together, and use that Fryer Block to re-form the thing roughly back into a square. Walk away. More patience. More time. The dog is getting curious, the parrot is begging by saying "Hello!" and blowing kisses. They both want some of your scrapple-y goodness. But no, Dad was right. This was a special thing. This is Scrapple. Has it been long enough? Worry the edge up. Did it stick? No! 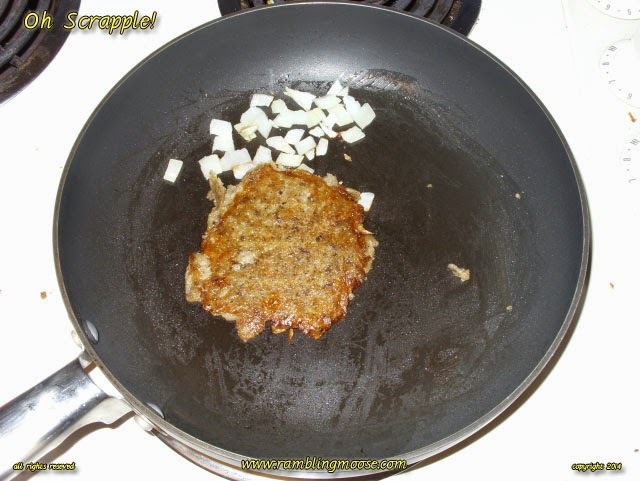 Tease the now thin Scrapple cookie up off the skillet. Place on the cheese to warm and melt it into the bagel. The egg you scrambled will get poured onto the onions that are now translucent with sweetness, your weekend breakfast commune with Dad will come soon. Reaching through the years, you taste the savory goodness and smile. I think of the Stoltzfus and Yoders in the Pennsylvania Dutch areas and thank them mentally for passing this recipe on through this day. This was a good breakfast. But it just doesn't stick together, no matter how tasty it is. Not to worry, I'll try again tomorrow. I have another slice to make. Maybe I'll get Dad's old Cast Iron skillet out. Really go Old School on this Scrapple thing. Serve it with some pancakes and real Vermont Maple Syrup. A slab of crumbly creamy crispy crusty heaven on a plate.